Specialising in the design and build of G.R.P. 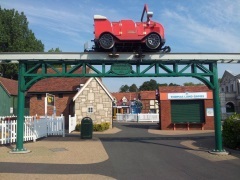 Props and Scenery for the theme park and leisure industry. Our demanding clients have a vision and it is our job to bring this to reality. All of our clients are different. While some come to us with a full design brief, there are others who need more of a guiding hand. For these we draw on many years of experience to build a relationship and help them develop their vision. Whatever the project, we give 100% commitment guaranteed - The secret to this is we love what we do! Dedicated to our business the following people ensure our success. Founded the company in 1958 as a decorator with obvious hidden talents - still an active member of the team with outstanding design & sculpting abilities. Derek has slowed down a little as he now only works 6 days a week! 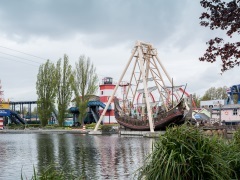 Joined the company in the 1990's and steered the company into the direction of theming. 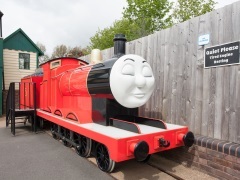 Jonathan's passion has lead the company into many interesting and varied projects, but his Thomas Land projects still remain some of his proudest achievements. Plays a vital role within the company coordinating role and responsibilities on all projects. Gaynor's gift is detail or as she says "the fluffy bits" that owners miss. Apart from our three key people we couldn't be the success we are without the help and support of our partners. All with their own expertise in fields which compliment theming and allow us to provide our complete service to you. 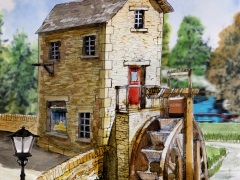 The Father and Son team of Derek and Jonathan Pope are an exceptional creative team. When the Theme Park was after a team of Theming Artists, creators and Set Designers we asked them that apart from being able to decorate can they create themed scenes for improvements to Thomas Land from 2008 and onwards, Thomas &and Friends themed Bedrooms within the new Hotel opened in 2011, the Knight Before Christmas opened in 2012 and Dinosaur Land plus numerous designs for Zoo Themed improvements they gave a great big thumbs up. The answer is “Yes” now what’s the question? 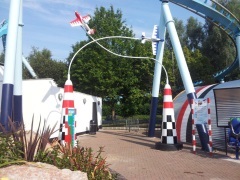 Drayton Manor Theme Park Ltd have used Derek and Jonathan Pope for the last 8 years and previously as Decorative Artists far longer. 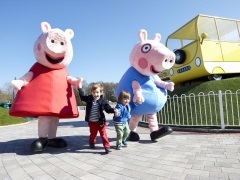 Colin J Bryan, CEO Drayton Manor Theme Park Ltd. The Popes show great pride in their work as every detail in the theming of props is very carefully thought about. When they showed us the drawings of how they wanted to theme out the buildings, I could not even imagine how they would accomplish it, they have thought about every detail large and small nothing is left in-themed. 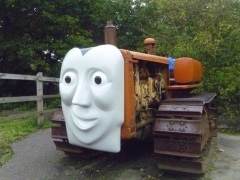 They have been a major factor as to how beautiful how Thomas Land turned out. They are always available anytime night and day and have been more than accommodating. 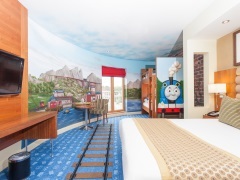 Jonathan Pope was commissioned to produce a number of themed character based displays, for both the hotel bedrooms and public areas, here at the Drayton Manor Hotel. The standard or work, attention to detail along with quality of individual design and manufacture, have proved to not only enhance the guest experience here at the hotel, but have enabled us to provide an exciting and memorable journey for our younger visitors, creating premium experience and feel to the finished article, all of which have been agreed and approved by the brand owner. It is rare to find bespoke craftsmanship in today's society, and I would have no hesitation in recommending Jonathan to any prospective client.